OECâ&#x20AC;&#x2122;s family of companies combine industry knowledge, innovation and integrated services to approach energy infrastructure problems from a different angle. Our teams of professionals provide timely and accurate utility locates, engineering, meter options, risk analysis, innovative mobile asset mapping and data applications. You can trust our solutions to ensure project timelines are maintained and damages to critical infrastructure is avoided. The Electricity Distributors Association (EDA) publishes The Distributor for its members and stakeholders. All rights to editorial content are reserved by the EDA. No article can be reproduced in whole or in part without the permission of the EDA. The Distributor welcomes Gerry Smallegange, President and CEO of Burlington Hydro, as Chair of EDA’s Board of Directors for 2019–20. Gerry took office officially at the EDA’s AGM on March 26. I am very pleased to share my first greeting as EDA Chair at a time when our sector is undergoing unprecedented transformation. Evolving market demands and consumer dynamics are reinventing how LDCs distribute power to local communities. Our sector is playing a pivotal role in designing and managing innovative services that provide customers with more value, convenience and control over their energy use. At Burlington Hydro, for example, we are demonstrating cogeneration technology and evaluating its effectiveness, with the objective of increasing sustainable district energy options for the city. We have also launched an electric vehicle (EV) charging station pilot to help us understand the impact on the grid and to better prepare for the wider adoption of EVs in the community. Many LDCs are looking for new ways to implement and integrate the latest technologies, including small-grid generation, storage and other distributed energy resources. But driving innovation forward requires that our regulatory and market frameworks evolve in step. For years, the EDA has been pressing for the removal of roadblocks to innovation. As your Chair and as leader of a progressive LDC, I am very pleased to see how the EDA’s advocacy is influencing the regulator and other stakeholders. 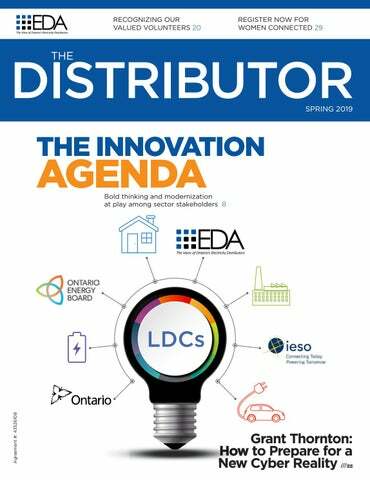 In this issue of The Distributor, our feature article discusses the electricity innovation agenda in Ontario right now. You will see what is taking place provincially and federally, as well as at the OEB and IESO. You will also see more examples of LDC innovation that are enhancing service for local customers and maximizing grid efficiency for the benefit of all Ontarians. Ontario’s LDCs are well equipped to propel the innovation agenda. Looking ahead, we will continue to transform the sector by offering customers more cost-effective, efficient energy solutions. Working together, through EDA, we can ensure our voice is heard by decision makers. Each year, the EDA prepares a report detailing activities and successes over the past year. Our 2018 Annual Report covers policy initiatives, advocacy achievements, event highlights and member engagement throughout 2018. It also recognizes the contributions of our dedicated volunteers and valued sponsors. Get your copy of the EDA’s 2018 Annual Report, available for download now at eda-on.ca. As part of Alectra’s CDM partnership with the OHL’s Hamilton Bulldogs, the team hosted an Alectra Game Day on February 2. John Friesen, Manager, External Communications at Alectra Utilities, joined Hamilton Bulldogs President and GM Steve Staios for the ceremonial puck drop, as the Bulldogs took on the Erie Otters. The Bulldogs also marked the occasion by donating a block of tickets to local schools. Technological innovation is reshaping and reinventing the skills and occupations required to support the electrical grid of the 21st century. In an effort to proactively address current and future needs of the electricity labour market, Electricity Human Resources Canada (EHRC) began last fall to explore the transformational impact of technology and innovation on the changing nature of work in the sector. Through this research, a total of 15 National Occupational Standards and Essential Skills Profiles are being revised or developed. According to the U.S. Bureau of Labor Statistics, two of the 15 – solar panel installer and wind turbine technician – are now the fastest growing areas of employment in 24 per cent of U.S. states. Funded in part by the Government of Canada’s Sectoral Initiative Program, the project supports the goal of addressing current and future skills shortages. In mid-February, the EDA’s President & CEO, Teresa Sarkesian, teamed up with Luc Levasseur, Vice President at NATIONAL Public Relations, to deliver a presentation on our Power of Local Hydro campaign at the Canadian Society of Association Executives Trillium Winter Summit in Burlington. The session described the campaign and its impact not only as a government and public relations initiative, but also as an opportunity for members to take part in influencing discussions and decisionmaking. Whether adding a Power of Local Hydro logo on a website, taking part in our video, tweeting with #poweroflocalhydro or submitting an innovation story, 38 per cent of members participated actively in the successful campaign, which continues to inform our outreach in 2019. Learn more at poweroflocalhydro.ca. Appointment: David Leonce, Westario Power Inc.
David Leonce, CET, MMP, PMP, first joined Westario Power in 2017 in the role of VP, Engineering and Operations. In 2018, he took on the role of Interim CEO. He has now been installed permanently as President and CEO. David brings more than 25 years’ experience in electrical and electronic engineering, industrial automation, power distribution design, T&D systems construction and maintenance, and Renewable Energy Technologies to his role. In this position, he provides leadership and drives the strategic direction of the organization. Proud supporter of the LDC Community. TD is a long-time EDA member and would like to thank our many Local Distribution Company customers for their business. ® The TD logo and other trade-marks are the property of The Toronto-Dominion Bank. ndustries worldwide are undergoing rapid change and disruption. Electricity is no exception. Emerging technologies, increased digitalization, changing consumer preferences, decarbonization and other factors are bringing about significant evolution in how electricity is generated and distributed. In Ontario, LDCs are seeking new approaches and opportunities to create value for shareholders and customers. Innovation creates both challenges and opportunities. New products and services have the potential to bring about dramatic improvements in efficiency, but they can also create uncertainty if sector participants are not prepared for change. As the electricity sector evolves, the roles and responsibilities of LDCs are evolving with it. LDCs cannot remain the “poles and wires” businesses of the past. As the owners and operators of Ontario’s distribution grid and as the customer face of the sector, LDCs need to be empowered as efficient, cost-effective service providers leading Ontario’s transition to a cleaner, more intelligent grid. LDCs want to be at the forefront. They want the ability to minimize risk and capitalize on new opportunities. More than just pursuing the “next new thing,” facilitating innovation is also critical to Ontario’s competitiveness. Preparing for and embracing change is necessary to achieve a resilient, low-carbon electricity system that can alleviate cost pressures, especially in the government’s active pursuit of a further 12 per cent bill reduction for consumers. The EDA has long emphasized to government and regulatory decision makers the importance of driving innovation by helping LDCs assume a critical function in the province’s energy transition. The EDA has advocated for grid modernization and enabling technologies, such as microgrids, energy storage and advanced grid-edge controls that support reliability and enhance resiliency. Leveraging innovative operational technologies and distributed energy resources (DERs), LDCs could be in position to reduce distribution costs, optimize efficiency and improve service. In 2017, the EDA outlined its vision for the future of the sector in “The Power to Connect: Advancing Customer-Driven Electricity Solutions for Ontario.” The vision paper proposed a new way forward for the province’s electricity system that recognizes consumers as drivers of change, with LDCs at the centre. The paper emphasized the imperative for LDCs to own, operate and integrate small-scale clean energy and storage systems (DERs) into their local systems to better meet consumer needs, while also augmenting the bulk power grid. More than just identifying problems, however, the “Roadmap” went further, outlining concrete steps Ontario’s policymakers could take to best serve the interests of an evolving industry. The paper offered nine high-level solutions that could be implemented over a 15-year timeline, including: • Level the playing field for DERs • Improve the definition of DERs and potential services • Allow investments in grid visibility • Decentralize procurement • Allow LDCs to control and operate DER assets • Locational marginal pricing Besides advocating for change, the EDA has gone a step further to warn that an unplanned, uncoordinated approach to adding DERs to the network may expose customers to higher costs and poor reliability. Augmented planning will ensure investments are right-sized to meet customers’ needs. Active visibility and control of resources would also inform distribution planning with respect to when resources should be maintained, retired or replaced. Recognizing that outdated regulations could prove the biggest business hurdle for the modernization of LDCs, the EDA pressed for a renewed framework that would allow LDCs to implement innovative tools and technologies for greater cost efficiency, system reliability and service. Besides benefiting individual customers, these technologies could enhance Ontario’s grid overall, which would benefit the province more broadly. At the end of 2017, the voice of the energy sector was heard when the Government of Ontario launched its Ontario Energy Board (OEB) Modernization Review Panel. Headed by Richard Dicerni, the Panel was formed to review Ontario’s energy regulator “to ensure it can best adapt to innovative services and new technologies.” (Government of Ontario News Bulletin, “Ontario Establishing Panel to Modernize the Ontario Energy Board,” December 14, 2017) In our formal submission to the government’s Modernization Review Panel last year, the EDA advocated for a review of the mandate, role and structure of the OEB, and greater flexibility for LDCs. The submission called for explicit promotion of innovation in the OEB’s core mandate, as well as innovationrelated cost recovery and incentives for LDC innovation. The OEB Modernization Review Panel report is currently with the Government of Ontario for evaluation. In the meantime, the OEB proceeded to establish its own Advisory Committee on Innovation (ACI) last fall. Chaired by Paul Murphy, the ACI was charged with identifying actions the regulator could take to support and enable cost-effective innovation, grid modernization and consumer choice. Over an eight-month period, the ACI examined business issues facing utilities, innovators and consumers. The Committee then focused on identifying potential solutions to address those issues. In November, the ACI submitted its report to the OEB Chair, including 14 recommendations in four broad areas: 1.Provide a transparent and level playing field by clarifying expectations and requirements regarding obligations between parties and towards customers; 2.Remove disincentives to innovative solutions by changing how utilities are remunerated, and introduce more systematic methods of valuation and pricing; 3.Encourage market-based solutions and customer choice by making more detailed and timely information available to sector participants; 4.Embrace simplified regulation by adopting simple and timely ways to allow for experimentation. The EDA was pleased to see significant alignment between the ACI report and the EDA’s Roadmap paper: • Restrictions on the ownership/operation of DERs should be addressed • LDCs should be permitted to own and operate DERs and associated enabling infrastructure • LDCs should be permitted to “see” DERs and recover associated investments in enabling infrastructure • DERs should be eligible to be included in Rate Base • LDCs should be permitted to share access to enabling systems and infrastructure The ACI hosted a Stakeholder Forum in January to discuss the Report and gather feedback on priority sequencing of recommendations and interdependencies for next steps regarding consultations and policy development. The Committee also sought written input from stakeholders. The EDA participated in the Stakeholder Forum and worked with Councils to prepare a formal submission. In January, the EDA’s written submission to the ACI commented on three issues: OEB priority actions: The EDA recommended that the near-term deployment of foundational investments be prioritized. Many LDCs have already begun investing in foundational infrastructure, such as Advanced Metering Infrastructure, smart inverters, two-way data flows, etc. The EDA also recommended clarifying today’s regulatory environment to enable LDCs to identify and evaluate technology deployment that will leverage foundational investments in ways that customers want and that the regulator would be able to approve readily. Interdependencies for planning and sequencing the OEB’s next steps: The policy environment and corresponding regulatory framework should be consistent and reflected in enabling legislation, licences, codes and guidance. This coordination will provide clarity and certainty that will support LDCs in bringing innovations to customers in ways that optimize customer benefits. Additional or complementary areas of inquiry: The OEB should address the consistency of its regulatory instruments. The EDA supports the OEB’s establishment of the “Innovation Sandbox” (see below) and foresees that it will be helpful in identifying gaps. The OEB could also provide Filing Guidelines that set out the evidentiary requirements for LDCs that seek to recover the costs of the innovative technologies through rates. The OEB also has established an “Innovation Sandbox” as an accessible mechanism for the OEB to support innovators testing new ideas, products, services and business models in the electricity sector. The Sandbox is designed to help utilities and other companies interested in innovative energy-related projects that have the potential to benefit consumers, whether through long-term economic efficiencies, cost performance improvements or service enhancements. Innovators can use the Sandbox to engage with OEB staff, access regulatory guidance and, where appropriate, receive temporary regulatory relief. Discover the possibilities of being local. Local businesses are engaged and present in the community. The customers who live in the 17 communities we serve know that we are there, supporting local initiatives that matter to them. They also realize that everyone can benefit from an energy ally. The IESO is developing an Innovation Roadmap to facilitate an internal and external dialogue on the evolution of Ontario’s electricity and broader energy sector as it relates to IESO’s mandate. The EDA supports the IESO’s efforts to create an Innovation Roadmap that aligns with the EDA’s position and direction. EDA members want to be active facilitators in a transformed electricity market, one that not only puts customers first but also maximizes the use and value of electricity assets. At the end of 2018, the EDA provided a written submission addressing three specific issues related to the IESO Roadmap: IESO priorities: The EDA proposed that the IESO emphasize the need for foundational investments in infrastructure that can support other investments. Many LDCs already deploy foundational infrastructure, such as SCADA systems. Other examples include electrically accurate depictions of the characteristics of existing infrastructure, and electrically accurate simulations of infrastructure loading/operations capable of estimating the consequences to achievable service life of investments in traditional and innovative technologies. The DER-enabling platform advocates the development of an intelligent method for integration of DERs within the distribution system, including network control and automation, Advanced Metering Infrastructure, smart inverters, two-way communications and advanced distribution management systems to improve visibility of assets that are operating within the networks. Learning and capability building: Capability building in the form of reorganizing system data that is presently available in multiple forms and media into forms/media that can be supported by IT/IS infrastructure (e.g.,: sensors, control devices, software and data sharing protocols that provide cyber security). LDCs can nurture capability building by engaging customers who are expected to realize tangible benefits – and who ideally will be willing to act as LDC capability building ambassadors. The integration of DER ownership into LDC business models will further stimulate DER market development and create certainty with respect to achieving public policy goals through coordinated DER planning. LDCs are well-positioned to take leadership roles. Removing barriers and enabling innovation: Enabling innovation requires risk management. First adopters of any new technology incur more and higher-level risk. LDCs should have responsibility for risks that are within their control, but they should not be responsible for risks under the control of other parties. As noted in the EDA’s Roadmap paper, the onus is on LDCs to demonstrate that investments are appropriate and eligible for inclusion in the rate base. This applies to all investments, including potential DERs. While DERs can be useful to meet local system needs, LDCs have indicated it is risky to leverage DERs in their Distribution System Plans because there is uncertainty with respect to the criteria for the evaluation of non-wires solutions (versus traditional distribution assets). With the appropriate tools, investment and regulatory support, LDCs will be able to plan, operate and coordinate DERs within their networks for the benefit of all Ontarians. As the voice of the LDC sector, the EDA is continuing to advocate with government and regulatory decision makers to create an environment conducive to grid optimization, cost efficiency and consumer choice. The EDA looks forward to seeing how the OEB will incorporate ACI recommendations. We are equally eager to see the report from the OEB Modernization Review Panel. This report — and the government’s policy response to it — could prove a defining factor in Ontario’s energy innovation future. We transform your needs in solutions! he energy industry continues to undergo transformational change toward more decentralized, decarbonized, digitalized solutions. Low-cost, renewable distributed energy resources (DERs) and storage, combined with digital intelligence and communication, are important change drivers in today’s market. Today’s customers are savvier, too. They want more personalized, affordable, controllable energy choices, along with seamless digital experiences. Alectra, currently serving more than one million homes and businesses throughout the Greater Golden Horseshoe area, is seeking to evolve into an innovative, integrated energy solutions provider that can plan, design and deliver on- and off-grid services, with a focus on green energy. The GRE&T (Green Energy & Technology) Centre is Alectra’s latest initiative to secure a position at the forefront of exciting industry changes. Located in Guelph, Alectra’s GRE&T Centre will serve as a hub to identify, evaluate, develop and deploy emerging green and customer-friendly energy solutions. The centre will bring energy innovations to life by identifying, evaluating, developing and deploying emerging green, customer-friendly energy solutions across Alectra’s service territory. It will ultimately catalyze the commercialization and mass consumer adoption of green technology, creating a bridge between the R&D phase and full commercialization of technology solutions. A Transitional Advisory Committee, comprised of representatives from Alectra’s communities, including senior management from Alectra and the former Guelph Hydro, has brought together subject matter experts in areas of clean energy, sustainability, customer insights and emerging technologies. Since early 2018, the group has provided guidance on strategy planning and development of the Alectra GRE&T Centre, including the setup of an accelerator and recommendations for potential partners, pilots and demo projects. To guide the strategic direction of the GRE&T Centre as it develops throughout 2019, Alectra is currently putting together a long-term Advisory Committee made up of professionals from diverse backgrounds, experienced with emerging technologies and clean energy, and demonstrating capabilities in the areas of commercialization, finance, investment, branding, marketing, intellectual property, legal, entrepreneurship, logistics, sales, and customer and product insights. The Advisory Committee will provide strategic advice related to the Alectra GRE&T Centre on pilot projects, demonstrations, partnerships, community engagement activities, accelerator operations, recruitment of cohorts and other related activities. The centre is expected to launch officially in 2020. Learn more about the Alectra GRE&T Centre at alectrautilities.com. n today’s society, homes, businesses and institutions rely on electricity for most basic functions. Unscheduled outages can cause major inconvenience for some, lost revenue for others. From home heating, cooling and appliances, to computer systems, WiFi and even most landline-connected telephones, electricity is essential for residential and business customers. It is no surprise, then, that public frustration with outages can be high, resulting in a barrage of angry tweets, comments and social media posts. Today’s utilities need innovative solutions for faster, more effective outage response. Distributed grid intelligence can be part of the solution for meeting stakeholders’ expectations. Customers in the Town of Oakville saw the value of distributed grid intelligence in December 2018, when a significant widespread outage was caused by failing equipment at a provincially owned transformer station. Initially, 9,523 customers were left without power. Fortunately, Oakville Hydro had invested in innovative technologies to deal with this type of situation more quickly and cost-effectively. Distributed grid intelligence helped automatically restore 1,085 customers in just 16 seconds, through the activation of five switchgear devices and layered automation devices. The remaining 8,438 customers had their power back on within six minutes. Oakville Hydro was able to restore power to all of the impacted customers, without dispatching a single crew to the field. responds to changing electricity grid conditions. The system uses algorithms and sensors to restore power to customers, often within seconds and without human intervention. Oakville Hydro now has more than 200 remotely automated devices. Implementation of this innovative technology at Oakville Hydro involved the following key tasks: • Fine-tuning sensing equipment, logic control and firmware in the local equipment • Collaborating with experts from Oakville Hydro, as well as those from equipment suppliers • Improving logic through grid intelligence to determine false readings • Placing Internet-of-Things (IoT) sensors to provide solutions that effectively connect the automated controllers for enhanced data capture The key to success in this transition has been a culture of innovation at the utility, building on the existing centralized SCADA control system, embedding enhanced intelligence into field devices. The company’s innovation journey reached several milestones in 2018, including increasing the switching density of devices per feeder, and the number of open points with field automation. In addition, the company’s deployment of device logic and fine-tuning of sensors was optimized. Now, when an outage occurs, the switching devices are able to detect the loss of power and automatically reconfigure the grid to an alternative supply point, allowing for almost immediate power restoration — with no human involvement. Many utilities still rely on customer phone calls and socialmedia posts to find out which areas of their distribution system have been affected by a power outage. Then, manual switching by the utility may be needed to restore power. A range of technologies has been developed to automate this process, however, making restoration appear almost instantaneous. This way, the utility’s network becomes a self-healing system — one that can go a long way towards minimizing power interruptions. In fact, some customers may not even notice that their power went out and was reconnected via a different source. Cody McMullin is an Innovation Lead with Oakville Enterprises. Kishen Pais is Manager, Grid Smart, Oakville Hydro (oakvillehydro.com). To learn more about OEC Innovates, visit: oecinnovates.com. Some automation solutions can be practical only for particularly large utilities, but distributed grid intelligence can be applied in many circumstances. With just over 70,000 customers served, Oakville is a good example of a mid-sized community that is able to benefit fully from this type of solution. Oakville Hydro is eager to connect with other local utilities to share ideas on how to apply distributed grid intelligence for enhanced outage response, to help improve productivity and quality of life for all residents and business owners. A BUSY START TO 2019 The first months of 2019 proved busy ones for the EDA and the sector. Since the beginning of the year, the EDA team has participated in a number of consultations, attended several informal meetings and delivered nine government and stakeholder submissions, including a pre-Budget submission to Ontario’s Minister of Finance. In January, we participated in the OEB’s Advisory Committee on Innovation (ACI) Stakeholder Forum. The EDA is pleased to see innovation on the agenda at the OEB, particularly the launch of the new Innovation Sandbox. We responded in writing to OEB questions regarding policy priorities and considerations. We now look forward to seeing how ACI and stakeholder recommendations will be implemented. The EDA also responded to calls for comment from the Ministry of the Environment on the new Made-in-Ontario Environment Plan, as well as from the OEB on proposed changes to Customer Service Rules and to codes around regional planning. And we were pleased to receive intervenor status, as the IESO seeks licence to monetize non-personal smart meter data — an issue of key interest for LDCs. The EDA expects that the 2019 Budget will be the most important piece of policy activity for the government during the current legislative session. In its pre-Budget submission to Ontario’s Ministry of Finance, the EDA called on the government to continue its support of voluntary consolidation and other innovative partnerships through tax certainty and clarity. The submission also emphasized strong support for a continued framework of successful, LDC-led energy conservation programs. The EDA team continues to meet with political staff and civil servants to ensure LDC priority issues remain on the government’s radar. Most recently, we met with senior staff from the Ministry of Energy, Northern Development & Mines to discuss the value of continuing LDC-led conservation programs. We have also held meetings with officials from the Premier’s Office; Ministry of Environment, Conservation and Parks; IESO; and OEB. Discussion topics have included LDC innovation, the Made-in-Ontario Environment Plan, paperless billing, LDC fiscal policy, electric vehicles, OEB reform and distributed energy resources. For ongoing updates on EDA advocacy activities, consultations and submissions, visit eda-on.ca. To date, LDCs have done an exceptional job delivering on electricity usage reduction targets called for in Ontario’s Conservation First Framework 2015–2020 (CFF). While the current CFF is still in play, the future of conservation programs and the role of LDCs in delivering them remains uncertain, as the government continues its quest to reduce the deficit and deliver on its promise of a further 12 per cent bill reduction for families. With professional guidance from a former PC party campaign chief, the EDA revisited our positioning in an effort to ramp up our advocacy. We are now using bold messages, targeted directly to Queen’s Park decisionmakers, to advocate for continued, locally led conservation program delivery now and beyond 2020. In February, the EDA held an LDC member webinar that provided a detailed overview of updated campaign messaging and tactics. We thank the more than 80 participants who joined us for the webinar to learn firsthand about the “Stop Energy Waste” campaign. In addition to the digital advertising component, the EDA is also calling on LDC members to submit their local conservation success stories. Stories highlighting how LDCs have helped customers reduce energy waste and save money are helping to influence MPPs and decisionmakers. Members can follow the campaign’s developments through the EDA’s LinkedIn, Twitter and Facebook channels. We encourage all LDCs to take part in the conversation using the hashtag: #StopEnergyWaste. GOVERNMENT QUEST FOR SAVINGS COULD IMPACT LDCs The PC Government remains eager to deliver on its promise to further reduce hydro bills by 12 per cent for families, farmers and small businesses. Recent announcements from the Ministry of Energy, Northern Development & Mines are focused on cost saving measures, such as Bruce Power’s January announcement regarding $200 million in savings from nuclear refurbishment, as well as an ongoing commitment to reform Hydro One executive compensation. The government is also working toward a promised Industrial Rate Consultation during the first half of 2019. The EDA will actively seek opportunities to provide LDC input. In its ongoing quest for savings, the government continues to push for efficiencies across all sectors, which could impact LDCs. For example, the recently announced Regional Government Consultation impacts the shareholders of up to 24 LDCs. The review will include consultations with municipal councillors and leaders, stakeholder organizations and the public in the spring of 2019. The review covers Ontario’s eight regional and lower-tier municipalities. In total, 82 upper- and lower-tier municipalities are included. The EDA will be monitoring progress of the review and providing feedback to members. EDA SUPPORTS ECCC’s CLEAN FUEL STANDARD REGULATORY DESIGN In February, the EDA provided comments on the Clean Fuel Standard (CFS) Regulatory Design Paper, issued by Environment and Climate Change Canada (ECCC). As the voice of Ontario’s LDCs, the EDA is advocating for CFS regulations that treat electricity equally with other low- or no-carbon fuels and enable distributors to take advantage of credits. Overall, the EDA supports the development of the CFS and its objectives of reducing GHG emissions, increasing the use of lower-carbon fuels and driving investments in clean technologies. Our submission expressed strong support for key components of the CFS policy design. We raised some concerns regarding the discussion on end-use fuel switching to electricity and the need for flexible credit systems structured to maximize efficiency with implementation. We were pleased with ECCC’s proposal to allow some end-use fuel switching to generate CFS compliance credits. We also welcomed the proposed approach to crediting end-use fuel switching to electricity for transportation, as it relates to the crediting of EV charging in different scenarios. LDC members can download our full submission to ECCC on the CFS Regulatory Design by logging in at eda-on.ca. For more information or to share your feedback, contact Lynn Williams, Senior Policy Advisor, at (905) 265-5334.
n light of regulatory changes implemented on March 15, 2018, the Ontario Energy Board (OEB) now requires all licensed electricity transmitters and distributors to provide information on how they intend to mitigate cybersecurity risks. Here, experts from Grant Thornton LLP — Mohamed Elghazouly, Senior Manager, Cybersecurity; RK Madan, Director of Technology Strategy & Architecture; and Sandy Boucher, Senior Investigator — answer some frequently asked cybersecurity questions to help LDCs better understand what this means for the electrical industry and to further strengthen cybersecurity efforts. Q: What do the OEB’s new cybersecurity standards entail, and what will LDCs need to do to meet them? Mohamed Elghazouly: Although LDCs are not yet required to comply with the Ontario Cyber Security Framework (OCSF), as of June 2018, they must fill out annual “readiness reports.” These self-assessments require companies to measure their current level of cybersecurity preparedness against both OCSF requirements and a separate data privacy protection standard based on Privacy by Design (PbD). This requirement is seen as a step in the right direction and one that complements the existing cybersecurity threat intelligence shared by the Independent Electricity System Operator (IESO). It also goes beyond existing NERC standards, which do not address privacy controls. Not only will these self-assessments help LDCs determine where they stand in terms of cybersecurity preparedness, but they will also allow the OEB to assess the state of cybersecurity readiness in the sector more effectively and to determine whether further action is necessary. The self-assessment is a good resource to have when initiating discussions with cybersecurity insurance providers. Q: What do LDCs need to do to effectively protect their IT/OT enterprise? forecasting, demand management, predictive maintenance and customer insights. By taking a holistic approach and creating a well-thought-out digital transformation and cybersecurity strategy, LDCs can leverage these technologies to improve their cybersecurity footprint and embed optimum cybersecurity measures in the enterprise architecture at the component level. This will allow them to truly maximize the benefits of ML/AI and other transformation initiatives. Q: How can forensic reviews improve an LDC’s cybersecurity framework? Hydro Ottawa was among the first utilities to sign up. “We didn’t hesitate to get involved because, from our perspective, it’s all upside,” said Hydro Ottawa’s Manager of Cybersecurity, Jojo Maalouf. “The electricity grid in the National Capital Region is critical infrastructure. We are confident that under the IESO’s leadership, and with the support of other utilities in the province, we will all benefit from the CSE partnership.” According to Blakely, all organizations that participate in the electricity sector have something to contribute, as well as a way to benefit: “This new capability can scale, as well as provide unique insights for all those involved, no matter their size. When the IESO receives information from CCCS, it may be customized for our sector, it may relate specifically to the bulk electricity system or it may be broader. There is strength in numbers, and in the information that’s shared.” There are 67 electrical utilities in Ontario, several of which are currently in the process of signing the necessary agreements. Electricity sector companies that want to join the IESO’s province-wide cybersecurity initiative can do so at any time. A new online service is now available to provide cybersecurity support to Ontario’s electricity utilities that want to share best practices, approaches, guidance and experience with their peers in a secure environment. Available thanks to a new partnership between the IESO and the Canadian Cyber Threat Exchange (CCTX), the service is housed in a centralized and secure online portal. According to the Ponemon Institute, an average of 39 per cent of all cyber-attacks can be thwarted by an organization sharing threat intelligence with peers. The online portal is a “one-stop shop” for cybersecurity information for Ontario’s electricity sector. The IESO’s cybersecurity team manages all content, acting as moderator and issuing updates. For access to the portal, or for more information, contact cybersecurity@ieso.ca. he City of Stratford is the Canadian leader in battery storage facilities, thanks to Festival Hydro’s battery storage project in the Wright Business Park. This is the first step towards building a microgrid, which can provide the community with more efficient, safer and cleaner energy. The project is a partnership between Hecate Energy, Saturn Power, Powin Energy and EllisDon Construction and Building Services. The facility is housed on an acre of land adjacent to a Festival Hydro transformer station. Using Powin Energy’s Stack140 energy storage system, the facility houses four lithiumion battery cell arrays – two with a capacity of 2.0 megawatts, and two with a capacity of 2.4 megawatts. Together, the battery cell arrays will provide a storage capacity of 8.8 megawatts, which translates to 40.8 megawatt hours of available energy – enough to supply more than 10,000 homes with electricity for an hour. lead in innovation. “This project speaks to the fact that Stratford is on the radar for large companies making technology and innovative investments. And they want to be here,” he said. Festival Hydro distributes power to approximately 20,000 customers in the municipalities of Stratford, Brussels, Dashwood, Hensall, St. Marys, Seaforth and Zurich. Festival is also responsible for water billing and streetlight maintenance. For more information, visit festivalhydro.com. Thanks to our sponsors for their generous support in helping make EDIST 2019 a resounding success. Save the date! Mark your calendar for EDIST 2020: January 15–17, 2020. Each year, the EDA invites members to submit abstracts for consideration by our EDIST Committee. Stay tuned for the #EDIST2020 Call for Papers, coming this summer. Silver Sponsors: Convergent Energy + Power, Jomar Innovative Software and NorthStar Utilities Solutions Event Sponsors: ABB Inc. and S&C Electric Canada Ltd. The first winner of our the new CON::NECT Event Series QR code survey prize draw! For more information on EDIST 2020, please contact Marica Macura, Director of Member Relations & Events, at (905) 265-5346. Women Connected is an exciting, inspiring day of learning and networking for women — and all those who support the advancement of women — in the electricity sector. Whether you are just starting out in the industry or an experienced senior leader, join us for unparalleled opportunities to gain new insights, connect with colleagues and explore ideas for women within electricity utilities, affiliates, municipalities, commercial enterprises and associations related to the sector. Women Connected 2019 takes place May 15, 2019 at The Design Exchange in downtown Toronto. Check out the complete Women Connected 2019 program and register now at eda-on.ca. For more information and sponsorship opportunities, you can also contact Marica Macura, Director, Member Relations & Events, at (905) 265-5346. The Latest Insights on Corporate Governance The EDA Directors Summit explores the latest ideas, best practices and strategies for hydro utility directors, corporate secretaries and staff with governance responsibilities. Join peers from utilities across Ontario to discuss the challenges and opportunities facing boards today. Hear from recognized governance experts and thought leaders on how to enhance leadership and optimize board performance. The EDA Directors Summit provides opportunities to: • Enhance board member knowledge, skills and contributions • Gain valuable insights from industry leaders, peers and advisors • E  quip board members and executive management with valuable tools to fulfill their fiduciary duties, add value and advance corporate goals Directors Summit 2019 takes place June 12. Stay tuned to eda-on.ca for complete program details and registration. For more information and sponsorship opportunities, you can also contact Marica Macura, Director, Member Relations & Events, at (905) 265-5346. Attend The MEARIE Conference where we’re exploring topics related to risk management/strategy and human resources/leadership. Our consulting services have multiplied to help you realize the full beneﬁt of smart grid technologies through systems integration studies, enterprise information management initiatives, and next-generation AMI procurements. Now serving over 1.2 million people across 56 communities, Util-Assist’s 24 x 7 outage management call centre is designed to scale for peak call volumes and widespread outages. CustomerAssist managed services deliver exception analysis and management, call centre overﬂow, and skilled back-up labour so that you can focus on your core business. 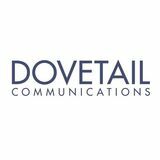 Util-Assist’s customer experience solutions leverage AMI to help you with dynamic pricing programs, shadow billing projects, and enhanced customer engagement and conservation initiatives.